This is a picture of the Yamuna in Indian city of Agra. The Yamuna (Sanskrit: यमुना), sometimes called Jamuna (Bengali: যমুনা, Hindi: जमुना, Urdu: جمنا‎) or Jumna, is a major river in North India. It is the largest branch of a bigger river called the Ganges. It is 1370 km long. It begins at the Yamunotri, which is in the Himalayas. It goes through the Indian states of Delhi, Haryana, and Uttar Pradesh. At the end, it flows into the Ganges. Rivers that come out of the Yamuna include the Tons (the largest of the ones that come out of it), Chambal, Betwa, and Ken. Yamuna as seen from the Taj Mahal, Agra. Madan Mohan temple, on the Yamuna, Vrindavan, 1789, it has shifted further away since then. 'Keshi Ghat' on the Yamuna, Vrindavan. Yamuna near Allahabad, just few kilometers before it meets the Ganges. Yamuna near Allahabad in the rainy season. 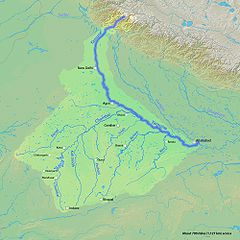 Wikimedia Commons has media related to Yamuna River. This page was last changed on 30 January 2018, at 07:03.